The enthusiast world typically falls into two camps: those who love rat rods and those that loathe them. As with every corner of automotive world, not all rats are created equally, but we tend to find ourselves firmly rooted in the former camp more often than not. That's especially true when we catch a glimpse of something as perfectly blasphemous as this BMW 2002. Crafted by the twisted minds at Atlanta Performance and Fabrication, the car actually started life as a running, driving round-taillight 2002 that owner John Lee had owned since high school. During a slow day at the shop, Lee rolled the car in, busted out the plasma cutter and got to work with parts just collecting dust in the garage. After crafting a frame from spare tubing, the suspension went together using coilovers from a C5 Chevrolet Corvette, a steering rack from a Cobalt SS and control arms from a derelict Panoz racer. While not originally a right-hand drive car, Lee swapped things around to accommodate the newer components. The rat Bimmer even uses a roof-mounted shifter for reasons that remain unclear. 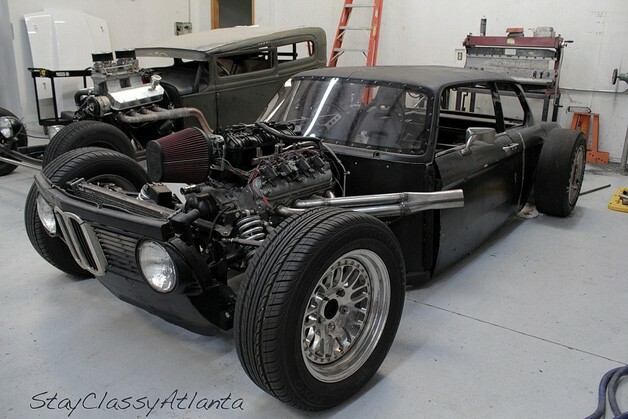 BMW 2002 makes for one unique rat rod [w/video] originally appeared on Autoblog on Mon, 16 Apr 2012 12:30:00 EST. Please see our terms for use of feeds.